December has arrived and well try to give you an accurate forecast in regards to the Xmas months fishing trends as well as the changing weather patterns, and how it all affects our Fort Lauderdale fishing areas. This is the time of year when we see the fronts pushing into our area. These early winter season weather systems are often accompanied by some rain, but the showers typically only last a couple of hours at the most. The skies clear quickly as a rule and were back in the sunshine, but a little cooler. Most of the fronts that arrive after the first of the year bring a lot colder weather. These fronts almost always are accompanied by wind. Occasionally quite a bit of wind. The ocean can be rough and we do on occasion have to cancel a charter when this happens. 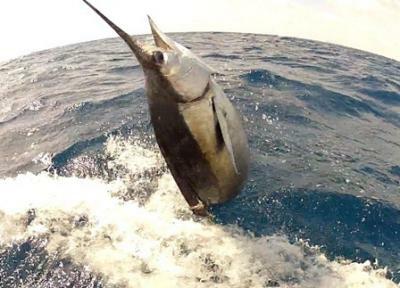 We are fortunate here in Ft. Lauderdale as the majority of our charters are spent within a couple of miles of shore. The deeper reefs are within a mile of the beach and at two miles we are fishing in 400 feet of water. This closeness to shore is great for us as the larger seas are further offshore from where we are fishing (in much smaller sea conditions). We fish many days here when boats at inlets north of us cant go out as they need to travel further offshore to find those depths. That being said, expect to see some wind on the majority of our December fishing days, with most of it being reasonable and a few days holding the flags stretched tight. Kingfish will continue to be in the area and we will catch some really good sized ones, mostly on live bait. Mutton Snappers and some Groupers will be on the wrecks and that reefline we mentioned. We expect to land a good number of Wahoo with the majority of these fish being taken by trolling, but live bait will score these fish as well. Some really good ones will be taken. Good sized Amberjacks and Sharks for the most part will be on vacation somewhere else, with only an occasional larger fish. With Mother Nature sending those winds we fully expect some really good Sailfish days. These fish love the wind and if the current is running we will be on the lookout for them. Once again live bait will be best, but we will get numerous bites by trolling natural dead baits. We expect pairs and small bunches of these fish now, with a single fish in the baits less common now that we are into our winter season. We hope you found this forecast helpful, there will be some good catches this month.